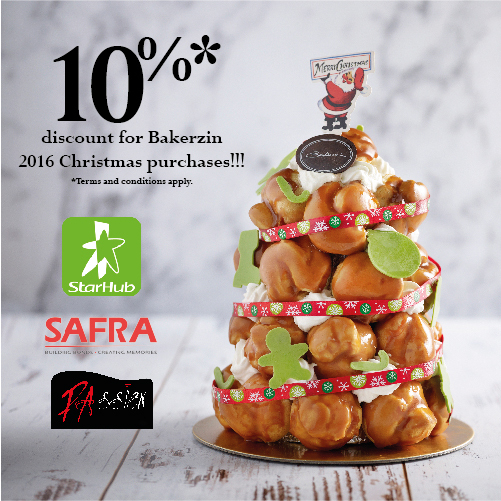 Monday | November 28, 2016	This year’s Christmas is extra loving and warm, with 10% discounts for the below 3 groups of members, namely; Starhub subscribers/members Bakerzin teams up with local telco, Starhub, to give their subscribers a rewarding experience this Christmas. A 10% discount is extended to all Starhub subscribers to purchase Bakerzin’s smorgasbord of delights including the tender and juicy Roast Cajun Capon, succulent and savoury Pineapple Glazed Gammon Ham and more traditional sweet and savoury treats. SAFRA members Bakerzin’s relationship with SAFRA goes back a long way, the seamless and strong rapport for both organizations transcend beyond words and this year, it is no difference. Many traditional favorites are brought back with new twist on Christmas log cakes, Chocolate Stump de Noel, made with light chiffon and filled with decadent chocolate mousse, be enthralled! PAssion Card members Spot a pretty Croquembouche? Wait no further, present your PAssion card and enjoy all Christmas delights, traditional and classic, from Sweet Treats to Good O’ Roasts! We have something for everyone. Delight your friends during gift exchanges with our cheerio Gingerbread Man, which can complement with a cup of warm milk or coffee! Bakerzin’s Enchanting White Christmas is filled with element of surprise and delight. Head on down to any Bakerzin’s outlets and place your orders! Oh and not to forget, an additional 10% Early Bird Discount applies from now til 11th December 2016.